The most common sites include the ampulla and isthmus of the fallopian tube. Less commonly, the ovaries, cervix or peritoneal cavity can be involved. In this article, we shall look at the risk factors, clinical features and management of an ectopic pregnancy. 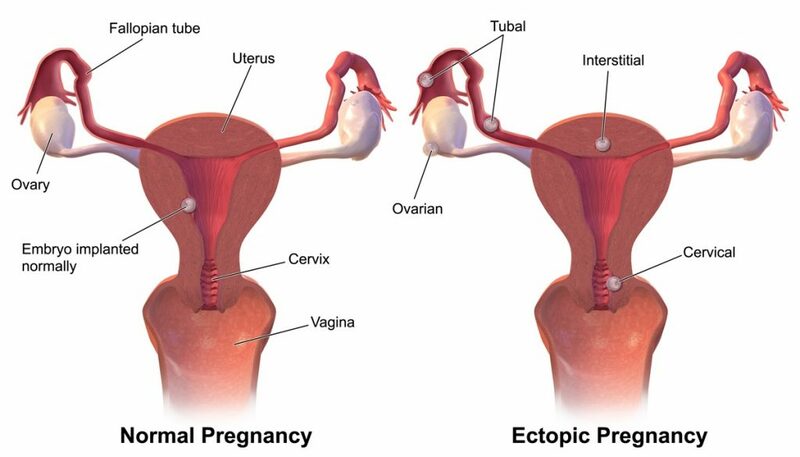 Fig 1 – An ectopic pregnancy is one that is implanted outside the uterine cavity. The risk factors for an ectopic pregnancy are shown in Table 1. Note: The use of contraception actually reduces the rate of pregnancy. However, if there is failure of the contraception types below, the pregnancy is more likely to be ectopic. The leading symptom of ectopic pregnancy is pain. Patients commonly present with lower abdominal/pelvic pain, with or without vaginal bleeding. There also can be a history of amenorrhoea. Note: Vaginal bleeding in ectopic pregnancy is the result of decidual breakdown in the uterine cavity due to suboptimal β-HCG levels. Bleeding from a ruptured ectopic pregnancy is usually intra-abdominal, not vaginal. Shoulder tip pain – the irritation of the diaphragm by blood in the peritoneal cavity leads to referred shoulder tip pain. This is because the diaphragm and the supraclavicular nerves (which innervate the shoulder tip) share the C3-C5 dermatomes. Vaginal discharge – brown in colour, classically described as being akin to prune juice. This is the result of the decidua breaking down. On examination, the patient may have localised abdominal tenderness, with vaginal examination revealing cervical excitation and/or adnexal tenderness. If the ectopic pregnancy has ruptured, the patient may also be haemodynamically unstable (pallor, increased capillary refill time, tachycardia, hypotension), with signs of peritonitis (abdominal rebound tenderness and guarding). Vaginal examination may reveal fullness in the pouch of Douglas. An ectopic pregnancy should always be considered in cases of abdominal pain in a woman of reproductive age. 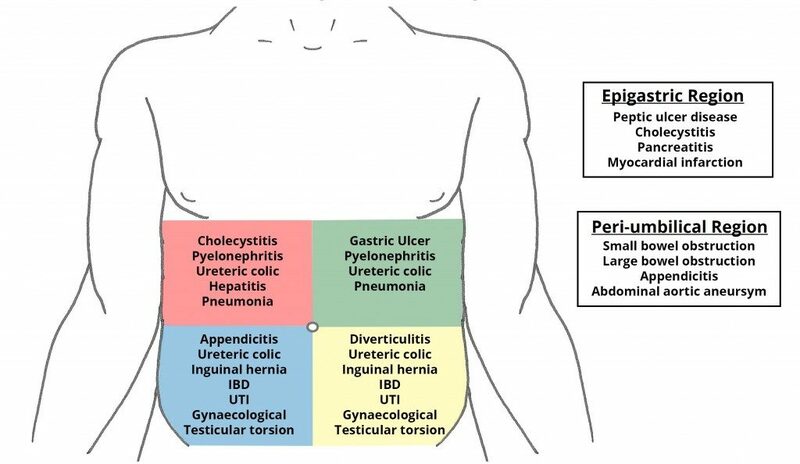 Fig 2 – Differential diagnoses for pain in each region of the abdomen. A pregnancy test (urine β-HCG) is the most important initial investigation for an ectopic pregnancy. If positive, a pelvic USS should be performed – this can determine the presence or absence of an intrauterine (‘normal’) pregnancy. If an intrauterine pregnancy is not seen on transabdominal USS, a transvaginal scan should be offered. If the initial β-HCG level is >1500 iU (discriminatory level), and there is no intrauterine pregnancy on transvaginal ultrasound, then this should be considered an ectopic pregnancy until proven otherwise, and a diagnostic laparoscopy should be offered. In a viable pregnancy, HCG level would be expected to double every 48 hours. Where the increase or drop in the rate of change is outside these limits, an ectopic pregnancy cannot be excluded and the patient should be managed accordingly. Other investigations should be used as appropriate to rule in/out the other differential diagnoses – e.g. urinalysis for urinary tract infection. Fig 3 – Ectopic pregnancy identified by transvaginal ultrasound, in a woman with an intrauterine contraceptive device (IUD). Any patient with a suspected ectopic pregnancy should be admitted to hospital. If unstable, an A-E approach should be used to resuscitate the patient. This may include the use of blood products if there are signs of haemodynamic instability. The definitive management of ectopic pregnancy can be medical, surgical, or conservative. Medical management of an ectopic pregnancy is with IM methotrexate. It is an anti-folate cytotoxic agent that disrupts the folate dependent cell division of the developing fetus. The pregnancy will then gradually resolve. The serum β-HCG level is monitored regularly to ensure the level is declining (by >15% in day 4-5). If there isn’t such a decline, a repeat dose is administered. Medical management is offered to patients who are stable, with well controlled pain and β-HCG levels <1500 iU/ml. The ectopic should be unruptured, and without a visible heartbeat. The patient should have access to 24-hour gynaecology services and be informed of the symptoms of rupture. Advantages: Avoids the complications of surgical management and the patient can be at home after the injection. Disadvantages: Potential side effects of methotrexate – abdominal pain, myelosuppression, renal dysfunction, hepatitis, teratogenesis (patients must be advised to use contraception for 3-6 months after methotrexate use). The treatment can fail, which would necessitate surgical intervention. Surgical management involves the surgical removal of the ectopic pregnancy. In cases of tubal ectopics (most common), a laparoscopic salpingectomy is usually performed – removing the ectopic and the tube that it is implanted in. However, if there is damage to the contralateral tube from infection, disease or surgery, a salpingotomy (a cut in the fallopian tube) can be performed to remove the ectopic and salvage the tube to preserve future fertility. Note: In a salpingotomy, HCG follow up is required until the level reaches <5iU (negative), to ensure there is no residual trophoblast. The risk of recurrent ectopic pregnancy in the salvaged tube will be increased. Surgical management is typically offered to patients with severe pain, serum β-HCG >5000 mIU/ml, adnexal mass >34 mm and/or fetal heartbeat visible on scan. Advantages: Reassurance about when the definitive treatment can be provided, high success rate. Disadvantages: General anaesthetic risk, risk of damage to neighbouring structures like the bladder, bowel, ureters, DVT/PE, haemorrhage, infection. With salpingotomy, there is also a risk of treatment failure – as some of the pregnancy may remain within the tube. All rhesus negative women who receive surgical management of an ectopic pregnancy should be offered Anti-D prophylaxis. 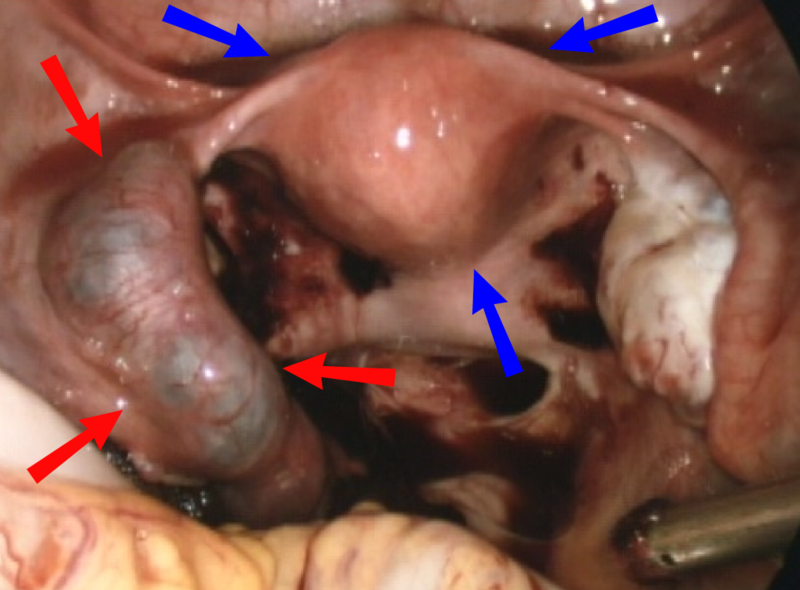 Fig 4 – Laparoscopic view of ectopic pregnancy within the left fallopian tube (red arrows). Uterus marked by blue arrows. Conservative management involves watchful waiting of the stable patient, while allowing the ectopic to resolve naturally. This is suitable in a small number of selected patients only, and is not the first line management. This approach needs to be discussed at senior level. The serum B-hCG should be monitored every 48 hrs to ensure it is falling by equal to or greater 50% of the level until it falls to approximately <5mIU/ml. This method is offered for patients in whom a rupture is unlikely; these are stable patients, with well controlled pain, with a low baseline β-HCG, small unruptured ectopic on USS. The patient should have access to 24-hour gynaecology services and informed of the symptoms of rupture. Advantages: Avoid the risks of medical and surgical management, can be done at home. Disadvantages: Failure or complications necessitating medical or surgical management (25% of patients), rupture of ectopic. Complications of individual treatments are detailed above. An untreated ectopic pregnancy can lead to fallopian tube rupture. The resulting blood loss can cause hypovolaemic shock, resulting in organ failure and death. What is the most common site of ectopic pregnancy?